Home > Studies & Seminars > EVENT: What do we (really) know about poverty? How do we measure it? Poverty cannot be truly understood without the input of those who live it and work alongside it every day. And yet too often that knowledge is left out as policies to address poverty are designed and implemented. As the world tackles the ambitious challenges of the UN’s Sustainable Development Agenda, seeking to “end poverty in all its forms” by 2030, the question of how we measure poverty and how we understand what poverty is has never been more pressing. 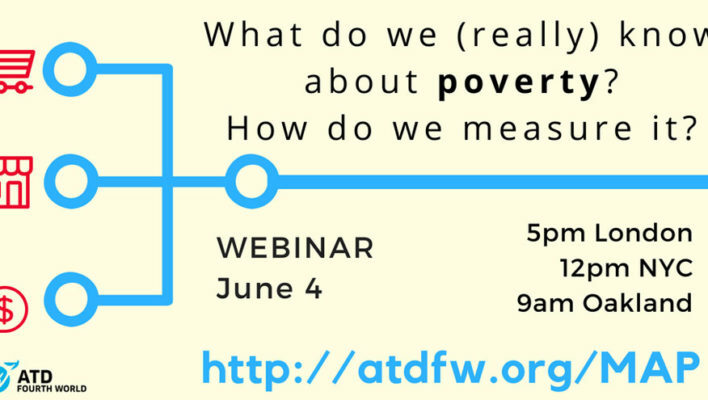 In partnership with Oxford University, ATD Fourth World is pursuing an ambitious multi-year research project to develop new approaches to measuring poverty, with the goal of informing how we understand poverty and how we design effective policies to fight poverty in the future. Conducting research in six countries on five continents, bringing together academics, people living in poverty, and practitioners who work alongside people in poverty every day is a significant challenge. What does it mean to include the knowledge of people in poverty in research work to end poverty? How should we build our research processes to make that possible? What are the implications of this kind of research for both academic research and public policy attempts to address poverty? Rachel Bray is a researcher whose work in southern Africa, Asia and the UK focuses on the experiences of families and children in contexts of poverty, and on how society responds to these. She is very interested in interactive research methods that help us work across common social boundaries, and enjoys working at the interface between academia, policy and practice. Rachel is currently based in Oxford combining a role on the International Coordinating Team for the joint ATD Fourth World and Oxford University Dimensions of Poverty study and a job supporting research students and postdocs in their career development. Donna Haig Friedman (USA) was director of UMass Boston’s Center for Social Policy for nearly 18 years. In this role, Donna led the CSP’s team in its research and evaluation work in Massachusetts and across the United States, much of the work focused on evaluating interventions and advancing social policies aimed at preventing family homelessness. Christian Josz is a Belgian national who works as an economist at the International Monetary Fund in Washington, DC. He has been an active supporter of the Fourth World Movement for the last 30 years in Belgium, France and the USA. He has been sitting on the board of its US chapter for the last three years.